I grew up in a typical Punjabi household. As a youngster I used to drink, and smoke cigarettes and marijuana. There were a few years where I didn't know what it was like to be sober. Even though I had these bad habits I used to care for people. Someone intervened in my life and asked us to meet a Gurmukh (elevated person). Meeting this person I had a strange sense of fear. I could feel the aura of this person before entering the room. There was a mirror of truth in front of me. I had never felt anything like it. I didn't understand how I was having this experience without smoking or drinking anything. It was from the power of the Naam this Gurmukh had. He questioned my father, and said some things he couldn't have known. That's when I first started to think that there might be something beyond the body. I didn't realize the power of the company I kept. So for 10 years I had a roller-coaster of a life. 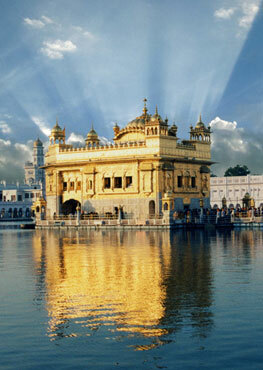 I kept trying to be in Sikhi, but I kept falling off of that boat. This chaos didn't finish until I got married. Even after being sober I felt that I had been conned. I had everything I wanted, but no contentment. Peace didn't come into my life until I began to have the desire to learn the meanings of Gurbani. I started trying to understand Japji Sahib. Everything in this world that makes you feel good decreases. But the Gurbani I was learning was giving me bliss that only increased. Then I started listening to katha, and it took over my life, day and night. I moved to a new house, and started a Sahej Paath, and we did it ourselves. Then someone asked me to teach their kids some Gurbani. Then people started asking me to teach, and we started a weekly class. It was a buzzing night. I would study one pauri during the week and present it on Friday. We would have langar and kirtan, and everyone looked forward to that night. Then I lost interest in working. All I wanted to do was learn more Gurbani. My mind wasn't in it anymore. I just had a feeling that one day I would be spreading the word of everything I was learning. My business declined and we almost had to sell our house. Then someone encouraged me to take this seriously and do parchar (teaching) full time. Jagraj Singh had been doing the Basics of Sikhi youtube channel for about 6 months. I was doing some katha at a program, and it got broadcast on Sikh Channel. Jagraj Singh happened to tune in that day. Then he put a message out to contact me. He is very focused on spreading Guru Nanak's message. He pressured me to get on board, but 'Basics' didn't have any funding at the time. So I started taking on more talks and trying to do my business at the same time. He gave me some time during one of his kathas, and he didn't have any jealousy. Then he came on afterwards and praised my katha, and then announced publicly that I would be joining full time. By Guru's grace I've been doing katha, and feeling so blessed to be a part of this. The Guru's word will uplift you. I can't be that they won't. As long as we focus on the Shabad everything we need will never run out. The Langar - the Kitchen of the Guru's Shabad - has been opened, and its supplies never run short.